Adding insulation to your home is mandatory wherever you live. It can protect you from the summer’s heat waves or the winter’s freezing cold, so what is the best way to go? While there are many insulation options, rigid foam insulation is the most effective method you can choose. Home insulation is a great way to save money on utility bills while also minimizing the consumption of non-renewable resources and thus protecting the environment. Spray cellulose, fiberglass bats, or foam are all viable alternatives, but you might want to go with foam board insulation if you have adequate workspace and access. Not only does it provide high R-values, but foam board insulation is also easy to install, lightweight, and can be used in any room of your home. In other words, rigid foam can be applied on walls, foundations, and roofs, and works great for both retrofits and new constructions. 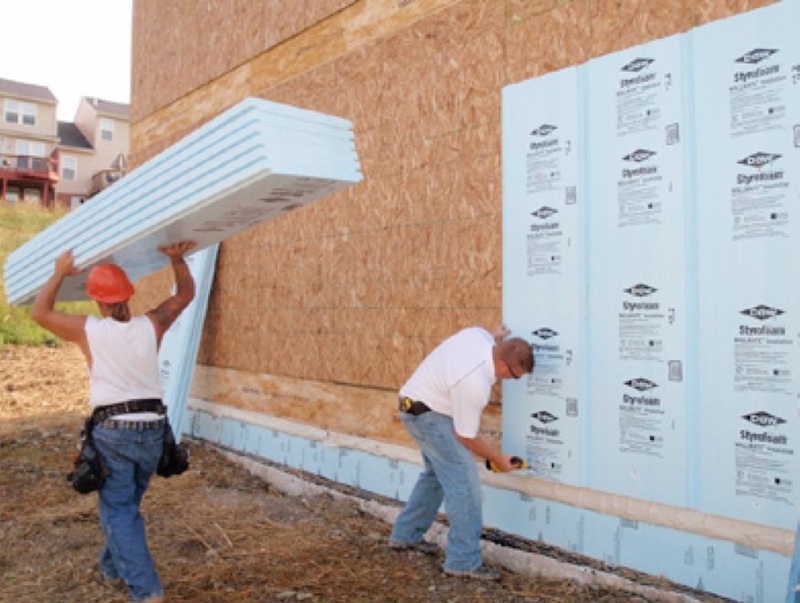 Most packs of rigid foam feature a higher R-value per inch than cellulose, fiberglass, or cotton. Rigid foam insulation creates a solid barrier between the inside and outside of your house, acting as an obstacle in the way of heat and cold transfer. However, not all rigid foam insulation packs are created equal. While most of them pack a lot of R-value into a thin layer, but you also have to consider how the insulation will affect the performance of your project, the overall costs, and the best method to get the bang for your buck. Expanded polystyrene (EPS), extruded polystyrene (XPS), and polyisocyanurate are the most used types of rigid foam insulation. While all foam insulation products are derived from petroleum, some of the key differences include water resistance, R-value per inch, compressive strength, facings, permeability to water vapor, and – evidently – cost. Let’s discuss each of these in detail to help you make a wise choice. EPS is, by far, the most versatile of the three rigid insulation options. It can be applied on the roof, floor, and walls, and it’s most widely used in structural insulated panels and insulated concrete forms. EPS is also the most inexpensive of the three types of rigid foam insulation, while also meeting the required building and energy codes. With the highest average R-value per dollar – 4.6 R per inch – EPS foam is approved for ground contact, can be treated to repel insects, and it does not retain water. When used as sheathing, EPS should be applied over house wrap; it comes as faced and unfaced. EPS manufacturers (like Insulfoam) warrant 100% of EPS’ R-value over the long term; the R-value of EPS does not degrade over time. This is the most easily recognized type of rigid foam insulation thanks to its popular blue, green, or pink color. As far as cost and R-value goes, XPS is the middle option of the three. XPS is a recyclable insulation that’s mostly used in walls and below grade applications. The cost of this R-5 per inch valued insulation material is quite affordable (approximately 42¢ per sq. ft. for a 1-in.-thick 4×8 panel). XPS is available as unfaced or paired with a number of various plastic facings. The 1-in.-thick unfaced XPS is semipermeable, and thicker and faced XPS can feature a lower perm rating. Given that XPS absorbs a lot of moisture over the long term, its warranty doesn’t stay true to its original R-value over the long haul. ISO panels are usually used in roofing applications, but they can get rather expensive. For a high-quality material, the price can get as high as 70¢ per sq. ft. for a 1-in.-thick panel. In exchange, they offer (aged) R-values of R-6.5 per inch. ISO R-values degrade slightly over time. The problem with ISO panels is that the manufacturing process is not environmentally friendly. Moreover, it also cannot be recycled because it starts as liquid foam. This is also why all ISO panels are faced. The different facings can affect the performance of the panel, both in terms of durability and perm rating. However, foil-faced ISO panels are warranted as impermeable. If you want to use them without creating a vapor barrier, look for permeable ISO panels faced with fiberglass. There’s two ways you can go about with foam board insulation. Firstly, you can apply it directly onto the house’s concrete walls with the help of a construction adhesive that will hold it in place. Secondly – and this is the best way – you can install a drywall to frame the wall before applying foam board insulation. Use 2×2-inch lumber for the studs and 2×3-inch lumber for the top and bottom plates. Then, cut your insulation panels to fit between the furring strips. When it comes to cutting rigid foam insulation, one of the easiest ways is to use a fine toothed handsaw. This way, you can vacuum the fine foam created by the fine teeth more easily. However, you can also opt for the tip of the blade of a craft knife to score a line. Then extend the blade completely to make a second cut which will slice the rest of the board. It’s very important that you keep in mind the one major drawback of polyurethane foam. Even though it offers many advantages, it’s also highly flammable. Fire safety regulation requires you to cover it by at least a 1/2-inch sheet of drywall. This is necessary even when you use it in the attic, garage, or other unfinished spaces. When you use polyurethane foam outdoors, make sure you cover it with siding or other protective finish. Now that you know your options, there are just a few more tips that you might need before you get started with installing your rigid foam insulation. Keep foam board insulation away from direct sunlight prior to installation; it will degrade its R-value. Cover the insulation with a vapor barrier before you install it; all foam boards absorb water vapor. When installing the foam, use caulk or tape for maximum insulation between the material and the board or floor.